To extend access to vital information, in 2010 the city consolidated all its data into a central ArcGIS for Servergeodatabase. It leveraged ArcGIS 3D Analyst so that it could analyze 3D models in multiple ways. Through ArcGIS Explorer, the models were then made available to urban planners, environmental engineers, and building management staff online. These models are frequently consulted to measure the impact of proposed construction on existing city assets. For example, shadow analysis enables city planners to measure the impact of proposed buildings on public swimming pools. If it is determined that a new building will cast a shadow that may negatively impact a public pool, the proposed development is relocated. To ensure safety, 3D models of proposed city buildings are also combined with a digital elevation model to measure the impact of new construction on flood risk, particularly within the city’s flood-prone areas. Similarly, 3D models are used to maintain visual harmony between new construction and heritage properties. For example, throughout certain areas of the city, buildings can only be a few stories high, and all buildings within the city are subject to energy efficiency standards. When a building is found to contravene regulations, measures are taken to bolster compliance while preserving the building’s unique character. ArcGIS 3D modeling has proved especially useful for the city’s highly publicized $1.5 billion tramway project. 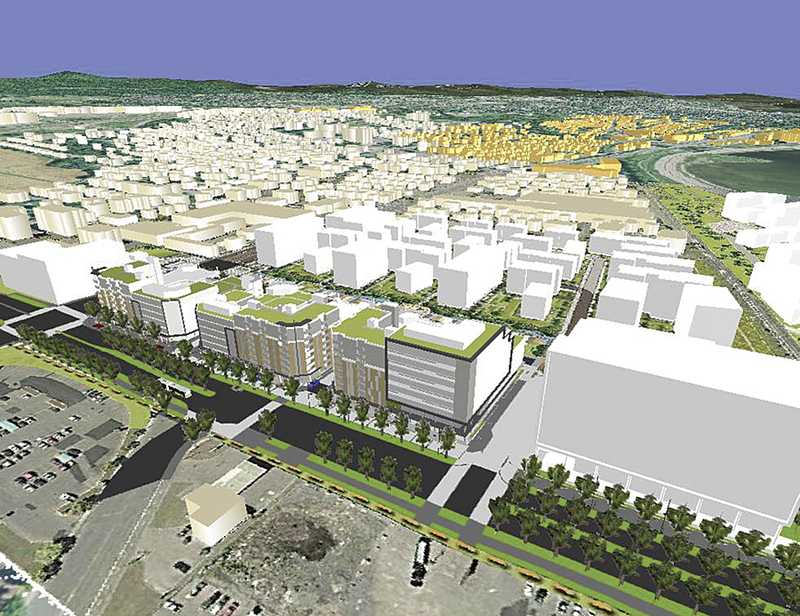 The proposed tramway, currently in its preliminary stage, would connect the suburbs to the downtown core, hospitals, and shopping centers, serving as a hub for the city’s public transportation. It would also encourage residential development in the city’s core. Using ArcGIS 3D Analyst, the city was able to integrate 3D elements from internal sources, as well as external suppliers, for the entire 27-kilometer network. As a result, system benefits could be clearly demonstrated to both potential investors and the public. A 3D model was also developed to inform the construction of a new recreational arena. Through 3D visualization, building managers were able to develop a comprehensive plan outlining a two-phase approach to construction: the first would focus on the development of an ice rink, and the second would center on building a new soccer field. During public consultations, 3D visualization was used to inform nearby residents of the arena’s impact on surrounding neighborhoods.